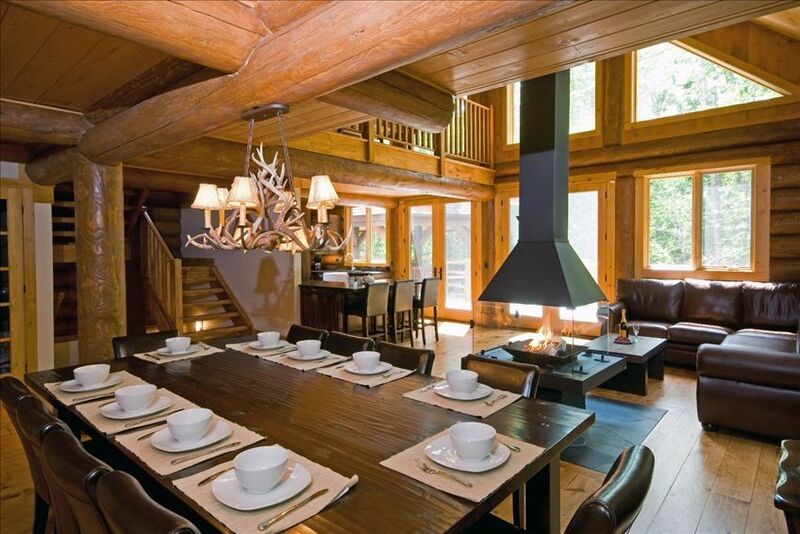 Chalet RiverLog is perfect for families, friends, and extended stays at beautiful Mont Tremblant. In summer time, enjoy the endless hiking, golfing, ziplining, tennis, and myriad of activities. Before you overheat, dip your toes in the private river frontage or visit one of the lake beaches nearby. In winter, skiing is the primary attraction. Whether enjoying the simple pleasures of our 4-sided glass fireplace, or racing down the slopes, you'll love your stay. Within a mere few minutes drive from the home, you will find activities such as dog sledding, ice skating, tubing, and much more. And after exciting regional activities and adventures, all will enjoy the in-house movie theater, the pool table, foosball table, the outdoor hot tub, indoor fireplace, and the PS3 w/ 12 foot screen. Kids enjoy the bunk room, which sleeps six. Adults enjoy each having their own private bedrooms. Bathrooms are equipped with jetted showers, granite counters, infinity edged bath tub, and heated floors. Please note that the fifth bedroom by night is the movie theatre room by day. Less than 2 miles from the action and excitement of Tremblant’s south side, the chalet is tucked away at the end of a picturesque country road that shadows the beautiful Devil’s river. Surrounded by 100 acres of wilderness, you will feel like you have found a true Canadian North escape while being only minutes away from everything you would expect of a major world class resort. Please note that we DO NOT RENT SINGLE NIGHTS. We emphasize longer stays. And you'll need the time to enjoy all that Tremblant and Chalet Riverlog have to offer. Contact us about how we can make extended stays more affordable. The house has over 600 feet of river frontage. Excellent fly fishing is available right from the shore. Some people swim in the river, but be warned the current is strong and water level varies. Some people enjoy swimming in the devil's river; it is not recommended. The water is fast moving and depth varies significantly throughout the summer. The development technically is an immediate neighbor of the Diable golf course. However, with 40 acres of wilderness between the house and the golf course, you won't have to worry about stray golf balls. Enjoy the adventure of walking along the forest trails right up to hole # 7 of the Diable golf course. Cross country ski trails and snowshoeing trails leave from our front door. Go 100km + without having to cross a street. Alpine skiing does require a 2 minute drive though. THe home fronts onto the devil's river. With over 800 feet of private shoreline, this is ideal for nature observation, fly fishing, and if you are experienced and self equiped, white water kayaking. Local telephone calling is included for free. We have roughly 30 videos available for your enjoyment. Mont Tremblant alpine resort is a short 3 minute drive away. You can cross country ski or snowshoe from the property on a connected network of 100km+ of trails. Mont Tremblant tennis club (available to public $) is 2 minutes drive away. le Diable and Le Geabt are each 2 minutes drive away. Another 4 course are located within 7 minutes. THe outdoor hot tub is covered and screened so you can enjoy it 12 months a year, regardless of weather. This great house is so close to everything with all the amenities you need for your family and friends! Not only did this put this trip over the top for us, but the owner is great and accommodating. Definitely thinking of coming back to Mont Tremblant and this will be the place I will be staying at when I do! Le Circuit Mont Tremblant is a world class automobile racing track. Home track of Lance Stroll, the hottest rookie on the F1 circuit. There are usually 4 or 5 exciting events per year. Check the schedule for event schedule. Be warned not to golf or plan other outdoor activities when track is operating a special event due to noise.